Those look like regular potato chips, don’t they? So misleading. 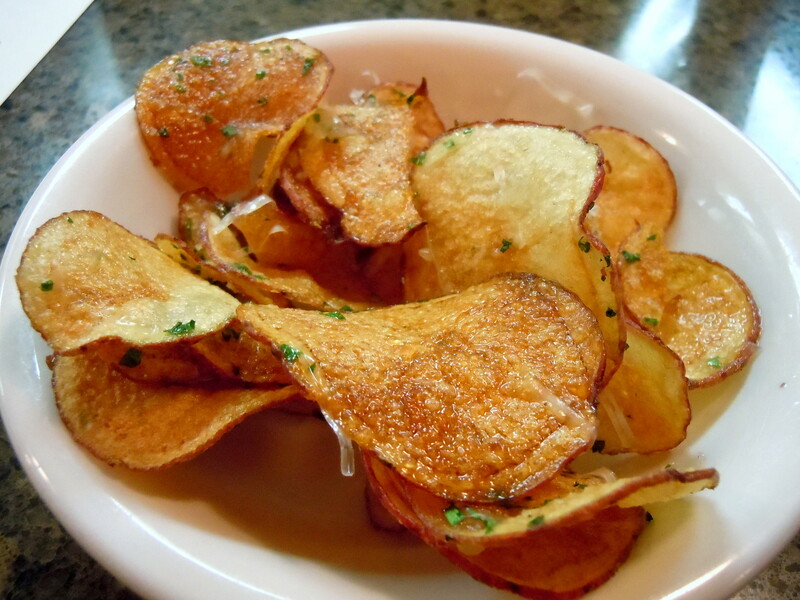 In fact, what you see above is a bowl of Christian’s Bistro’s Wisconsin Red Potato Truffle Chips with parmesan and fresh herbs. Not the same thing at all. These chips are crunchy and ethereal at the same time. They crackle when you bite into them, then melt into pure flavor. They’re made to order, drizzled with truffle oil and sprinkled with just enough parmesan to add a sweetly salty touch. You taste the earthy truffles as well, but the potatoes come through. Pure heaven. If ever there was a reason to visit central Wisconsin (and there are many), Christian’s Bistro is it. CIA-trained chef Christian Czerwonka worked his way through the kitchens of Emeril Lagasse’s restaurants before opening the Bistro. His food hints at his New Orleans influence (the gumbos are to die for), but is not limited to that style. 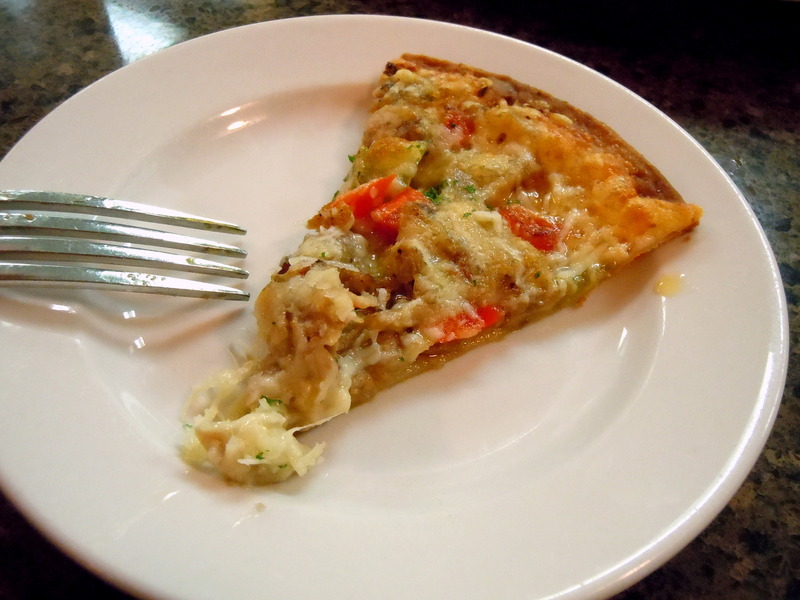 He uses mostly local ingredients, which can be a challenge in this cold climate. Tom and I went to Christian’s for our anniversary last year. I mentioned to our server as we were ordering how much I’d loved those chips, which weren’t on the menu at the time. A few minutes later, a bowl of the chips appeared on our table, an unexpected and thoughtful gesture. Tom and I had lunch a the Bistro last week with our friend Mike. At my request, we ate at the bar in front of the kitchen so we could watch the chefs at work. We started with an amuse bouche: a squash ravioli topped with shreds of cheese, toasted until crisp, and served with a balsamic reduction, a tangy counterpart to the sweet filling. Next came the Southwestern grilled chicken flautas, tender shredded chicken wrapped in a shatteringly flaky crust, served on a dab of cilantro-lime crema. I was tempted to ask Chef to forget the rest of our order and keep these coming, but then out came the potato chips — and my camera, which I’d forgotten about. After the chips, we tasted the crisp, chewy flatbread of the day, topped with tender local roast pork, sweet red bell peppers, and local sharp white cheddar. 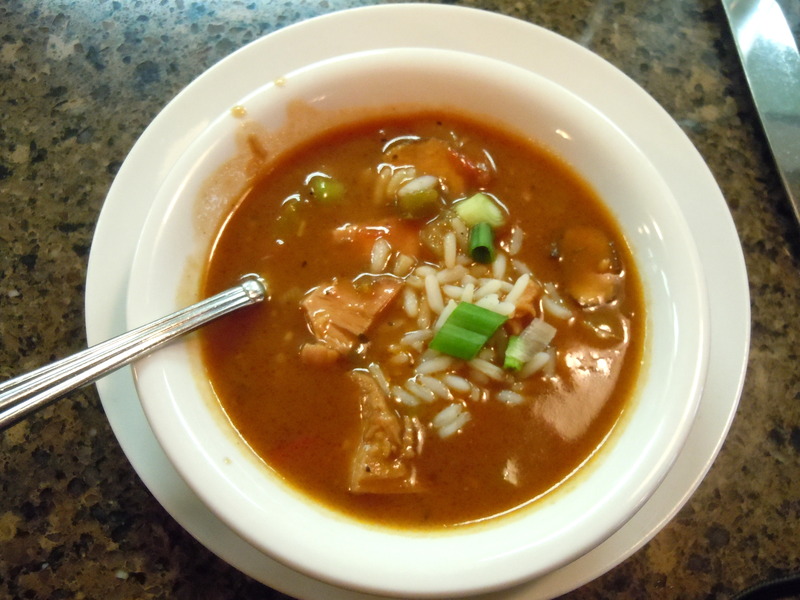 Following the flatbread were small bowls of a complex, aromatic gumbo made with turkey and wild mushrooms, served in the traditional manner over white rice. Finally, we were on to our main courses. 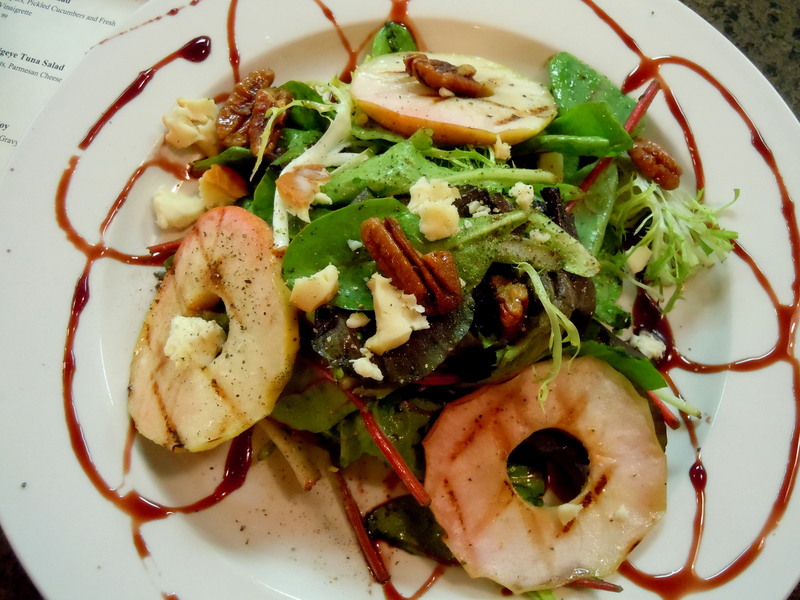 I had the grilled local apple and mixed green salad with candied pecans and drizzled with port wine syrup. It was finished with a local Wisconsin cheese from Roth Kase Dairy called Moody Blue, rich and creamy, with a light smokiness. We finished with cream puffs filled with light, rich chocolate mousse and accented with crème Anglaise and raspberry sauce. I took mine to go, fully intending to savor it that evening. I ate it the minute I got home. Such willpower. Stuffed and satisfied though I was, I drove home brimming with ideas and inspired to get cooking. I can’t hope to cook at Christian’s level, but I can learn from the experience. And what an experience it was. This entry was posted in restaurant and cookbook reviews. Bookmark the permalink.